Producing panoramas and/or 360-degree photographs is pretty common on smartphones. The feature is usually built into the native camera application, or can be downloaded as apps such as PanoramaPro PanoramaPro: Take Panoramic Photos From Your Phone [Android] PanoramaPro: Take Panoramic Photos From Your Phone [Android] Read More and Pano Create Stunning Panoramic Images With Pano [Android] Create Stunning Panoramic Images With Pano [Android] Today we’re going to be looking at Pano, a camera app that currently goes for $2 on the Android Market. Pano has no built-in effects; it doesn’t have advanced shutter controls or a built-in timer.... Read More . However, many of these aren’t quite as easy to use as they could be (through obvious limitations) due to the need to “scan the horizon” and requiring software on the device to stitch the many pictures together. So, if you’re after a very easy way to take a 360-degree picture, you’re pretty much out of luck. Unless, that is, you get the Ricoh Theta. Maybe. We’re giving this $400 Ricoh Theta 360-degree camera away to one fortunate MakeUseOf reader! Continue reading to find out more about the device, then join the giveaway to win! The Ricoh Theta is a special gadget that is designed to take spherical 360-degree photos thanks to two purposefully-designed cameras. In fact, it’s the first of its kind. If you try to look for any other cameras that can do the same thing, you won’t find any. Therefore, the closest competitors to the Ricoh Theta would have to be Android and iOS devices. Of course, they can vary from price and features, as well as how good the panorama/360-degree photos turn out. The general idea behind the Ricoh Theta is to provide the ability to take 1-click 360-degree photos, instead of producing panoramas the “traditional” way — which is panning the horizon with your smartphone or camera. With just one click of a button, the Theta uses cameras on both sides of the device to simultaneously capture its surroundings and stitch the two photos into a complete 360-degree image. It sounds sophisticated but there are some design flaws. Oh, and the Ricoh Theta costs a whopping $400. Here’s everything you need to know about the Ricoh Theta. On paper, it looks impressive. The megapixels count wasn’t published by Ricoh. The packaging is very straightforward. After opening the box, you’ll immediately find the camera itself. After removing the camera, you can pull out some cardboard to find a quick start guide, a protective case, and a USB-to-microUSB cable used for charging and computer-to-device communication. I have to say, the camera is very well designed. It can easily be assumed that it had simplicity in mind, as the camera only has three buttons — it’s on/off switch, a Wi-Fi on/off switch, and the shutter button. Along the bottom, you’ll find the microUSB charging port and a tripod mount. Along the top, you’ll see a few holes that might make you think that there’s a microphone, but don’t be fooled because there isn’t. No video functionality here. Besides these, you’ll find a curved camera lens on either side of the device. If you look at the device from the side, you’ll be able to see not just the glass protecting the two lenses, but light seemingly reflected off of the lenses themselves. You’ll also find that the camera has a matte rubber finish, which is a good idea when holding a seemingly “simple” and small camera that costs $400. If you can see the light being reflected off the lenses, they can see you. This means that if you’re on the side of the device, both lenses will still be able to see you, and the camera can stitch the photos from both lenses together perfectly. This also works much better than stitching methods found in smartphones and tablets because it reduces the number of variables — primarily the stitching points from picture to picture. Because the lenses on the Theta fixed, the stitching points will be the same for every photo it takes. Setup is pretty much non-existent. You can immediately start using the camera after simply turning it on. You can also turn on the device, enable the WiFi, and connect to it via the smartphone app [No Longer Available] to use the camera. More on all that stuff later. The Theta makes some pretty impressive pictures. The camera stores the pictures that it takes in its internal memory. Each picture comes out to 3584 x 1792 pixels (roughly 6.4 MP) with an average size of 2.4 MB. They’re certainly 360-degrees — nothing can hide from it. After a bit of tinkering, I’ve noticed that if you want to be in the middle of the picture that it takes (rather than be split between the left and right edges), then you’ll want to have the side of the camera with the shutter button facing away from you. There is one major flaw to every picture that you take (when viewed in its raw form), however. 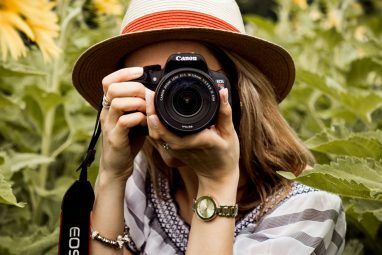 If you hold the camera like you would any other camera, you’ll notice that the bottom edge will have a rather noticeable capture of your hand and arm. This undesired effect doesn’t ever go away, and can only be minimized if you hold the camera as high as possible and only touch the shutter button with the very tip of your longest finger. You could remedy the situation with the help of a tripod, but even then you’ll need to reach for the shutter button in order to take a picture anyways (unless you trigger a shutter remotely; again, more on that in a bit). Ricoh does provide software for Windows and Mac OS X which can communicate with the Theta to download the pictures, update the camera’s firmware and turn the 360-degree pictures into spherical ones, also known as “little planet” pictures. If you’re mainly interested in the 360-degree pictures it takes, then you won’t need the software and you can simply copy the images from the device just like any other removable media storage. 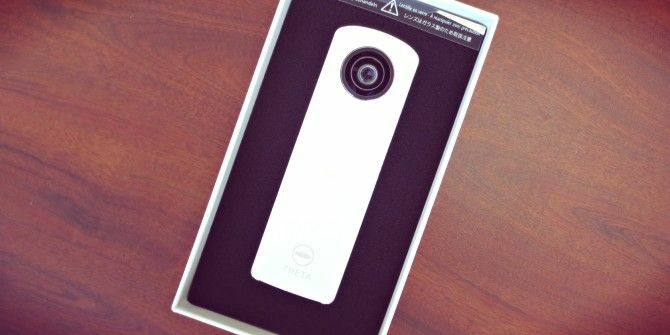 There’s also a smartphone app which can connect to the Ricoh Theta and offer the same functionality as the computer software. Unfortunately, the app is currently only available for iOS, so I wasn’t actually able to test it out. Additionally, it can also tap into the camera to change a few settings (supposedly) and remotely trigger the camera to take pictures without physically pressing the shutter button. This is where the WiFi functionality comes in, as the smartphone and the Theta need to communicate over WiFi for the app to work. The Theta creates its own ad-hoc — it doesn’t need to connect to an existing WiFi network. Random fact, but the Theta does also support Microsoft Photosynth Create Stunning 3D Panoramas on Your iPhone With Microsoft Photosynth [iOS] Create Stunning 3D Panoramas on Your iPhone With Microsoft Photosynth [iOS] Creating a panorama from multiple images is no longer the arduous, drawn out tweak-fest it used to be. Microsoft released a tool that could make a 3D panorama automatically, called Photosynth, and it really has... Read More , for any of you who use that. Although the Ricoh Theta is really cool simply because it can take 360-degree pictures, there are a handful of issues. First, Ricoh probably didn’t factor in the person holding the camera when designing the Theta — having your hand and arm blemish the images isn’t pleasant. The effect is reduced when the image is turned into a spherical/”little planet” photo, but otherwise you’ll have to use image editing software to crop out the offending portions of the image. 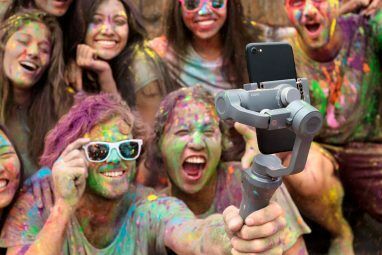 Secondly, if you wanted to use a tripod, you’ll still need to go ahead and press the shutter button to take a picture, which doesn’t eliminate the hand and arm issue. The only way I see a tripod helping is if you want a stable picture where you’re not the focus of the picture (where you’d be split between the left and right edges of the picture and would therefore have to crop yourself out). Finally, yes, you could use the smartphone app to remotely take a picture, but there are even more problems with this. It would only be useful if you’re using a tripod, and you’d have to position yourself so that it’s not obvious that you’re looking at your phone in order to take the picture. Or, you’d just have to go to a different room entirely (if you’re indoors) and then take the picture. Plus, as far as I can tell (since I wasn’t able to test the app), the camera doesn’t even have a timer — something that would relieve at least a few of these issues. Should you buy the Ricoh Theta? Long story short, the Ricoh Theta doesn’t quite work the way you and I may want it to work unless you have a very specific setup to take good pictures. If you want a great impromptu picture without any setup (i.e. holding the camera up and taking shots), it won’t work very well without having to resort to image editing later on. I’m sure that the camera has its uses, but it’s not made anywhere near for what I or most other people regularly do. It’s not very useful without the correct setups, and it’s way too expensive just to accomplish one task. For non-professionals, smart devices will end up doing a better job at what you’re expected to get when it comes to these types of photos. Congratulations, Patricia Conary! You would have received an email from jackson@makeuseof.com. Please respond before December 8 to claim your prize. Enquires beyond this date will not be entertained. Explore more about: Digital Camera, MakeUseOf Giveaway, Panorama, Photography. I would use it to take pics of the beach Thanks for the giveaway! Take pictures of my daughter! I'd use this really amazing camera to take pictures of the kids skiing this winter and then immediately upload to both sets of grandparents! I'd also use it to take Instagram pics and images for my blog reviews. You wrote an honest and great review of this camera and although I understand the negatives, I think the cool factor outweighs them and makes me really want to get my hands on this neat device! Thanks so much for the chance to enter. I love to take pics and this is so tomorrow . love it . thank u . If I win the Ricoh Theta, I’ll use it to take pictures for my new blog. take amazing photos and share them with as many people as I can!! If I win, I will use it to capture the life memories of my children growing up so fast. If I win the Ricoh Theta, I’ll use it to take pictures of the whole world !! Take great pics of my 7 grandkids. If I win the Ricoh Theta, I’ll use it to take pictures. Travel pictures in exotic locations. If I win the Ricoh Theta, I'll use it to take some nice pictures of nature landscapes. If i win the Ricoh Theta, I'll use it to capture every special moments with my loved ones. If I win the Ricoh Theta, I'll use it to take pictures. If I win the Ricoh Theta, I will use it to help map residential indoor spaces. This camera offers great photo opportunities. Take pictures of my new babies! I would use the Ricoh Theta for fun of it!!! If I win the Ricoh Theta, I’ll use it to take every achievement of my life. If I win the Ricoh Theta, I will use it to take pictures of my friends. If I win the Ricoh Theta, I'll use it to take some odd looking photos. I'll use it to take photos at work for fun and also take some beautiful landscape shots. If I win the Ricoh Theta, I’ll use it to take pictures when I travel. If I win I would enjoy life with others. If I win Ricoh Theta I will use it to spend more time with my family by working from home! If I win the Ricoh Theta, I'll use it to take stunning landscape photos! If I win the Ricoh Theta, I'll will use it to take great family photos. Take it hiking and make beautiful landscapes photos! If I win Ricoh Theta I will use it to shoot astonishing photos whenever I travel! If I win Ricoh Theta I will use it to take 360 degree pictures whereever I go! If I win the Ricoh Theta I will use it to take awesome pictures! If I win the Ricoh Theta I will use it to show off to all my friends,... and take fabulous images of us all together... Picture memories last forever! If I win Ricoh Theta, I’ll use give it to my lovely sister. If I win Ricoh Theta, I’ll use it to take 360-degree photos. Like the design. I will use it to show off to everyone who doesn't have one! That will make them go out and get one of their own! If I win Ricoh Theta I will use it to take 360-degree pictures on my travels. In a remote control helicopter to see the views from the air. If I win Ricoh Theta, I'll use it to take 360-degree photos. I love it's design. Although the output picture not perfect, I think this is a good gadget. I just consider about it's price. If I win the Ricoh Theta, I’d use it as a gift for my daughter and son for Christmas. They are good kids and they don`t ask for much so this would be the perfect gift for them! If I win the Ricoh Theta, I'll use it to watch my children turning into wonderful adults! If I win the Ricoh Theta I will use it to capture moments of my three dachshunds! I'll use it to take interesting landscape photographs. If I win the Ricoh Theta, I'll use it to take candid pictures of my family, dog and special occasions. If I win the Roch Theta, I'd use it as a Christmas gift for my daughter in law who is an amateur photographer. If I win the Ricoh Theta ,I'll use it to capture in 360 degrees all the beautiful things in 365 days in every year that life has to offer!! If I win the Ricoh Theta ,I'll use it to capture moments that I want to cherish for a lifetime & also I would capture all the beautiful things that life has to offer!! If I win, I will capture my beaches as they are always changing. If I win the Ricoh Theta, I will use it to take 360 degree photos. I would use this to take pictures of my nieces and nephews and especially my adorable loving puppies! If I win a ricoh, I would use it to take pictures of my nieces Christmas program this december. I would replace my very old camera and take much nicer pictures while traveling. improve my real estate business taking home pics! Go clickity click all around at my family outings! If I win the Ricoh Theta i will use it to take awesome photos. Take pics of my girls!! Take photo's of my daughter! Our camera just met an early demise and we need a new one! Take pics of my granddaughter and family having fun. If I win the Ricoh Theta, I will give it to my parents since they have a really sucky camera. I'll put it in my bag and bring it with me everyday! I'll happily use it to capture the incredible displays of nature all around me! Take funny pictures around town. I use it to carry around with me so I don't miss any important moments. I will use it to take some awesome pictures. If I win the Ricoh theta, I'll use it to easily capture the view of those places that have to be seen all the way around. I would use it to take pictures of my beautiful Grand daughter. for our trip to Disney World. I will use it to explore my photographic skills with this device as an add-on. I will explore my photographic skills with this device as an add-on. I will use it to take pics of our family! capture video of flying aircraft or wild animals near me. Pretty cool. I would use it for family vacations shots! I will use it to take all of my out door photos. Take cool pictures of work parking lots or building arreas, that businesses could use for G+ places. i will use it to capture photos with my family, special my baby boy jam.... hope to win it. I would do a review of it and probably bring it on family vacations and see what kind of shots I can get with it! I will use it to take a picture from the top of Everest. ...take panoramic photographs. Or did I misunderstand the article? I think it would be great for Fall foliage or lake shots. indeed a very nice camera. I extend my thanks for the chance! Take pictures! LOTS of pictures!! I will use it to picture our family celebrations. Make youtube video reviews and unboxings. I would use it to capture panoramas of my city for Google maps, mostly. I will use it to capture moments to cherish. I'll use it for fun, trying to take some original pictures, finding a good use for it. If i win the ricoh theta ill take it backpacking! I would use this all the time.I think it would be awesome to take before/after pictures for my fiance's business page!Very nice camera~thanks for the chance! If I win the Ricoh Theta, I'll use it to capture moments while I go from place to place working outside my home country! A real innovative tech for normal people. I have twin Great granddaughter toddlers, I would love to photograph them as they grow. take pictures of my art on all sides. I would use it too take fabulous pictures of my kids! ...make videos of my band. I will use it to develop better photography skills and improve the quality of my craft designs. If I win, I will use it to make sky jump! If I win, I will use it to make awesome photos! Take cool pics and impress my friends.. I'll use it to take pictures? If I win the Ricoh Theta, I'll use it to capture every moments with my child, later the photos may be a story when my child grow up. If I win Ricoh Theta, I'll use it to photograph my pussycat. If I win, I will use it to capture UFOs. Use it as my secondary camera. Take 360 degrees pictures of every place I take a dump. take pictures of me and my friends playing capoeira. I would be perfect. If I win I'll use it to capture the night sky! I'll use it to make weird videos in After Effects. If I win the Ricoh Theta, I'll use it to post an adventure every month! Use it to share my love of photography with my son. Nature, pets, active life photos could be made even more fun!! I'd give it to my nephew. As a pilot, I would use it to record some of my scenic flights. If I win the Ricoh Theta, I will use it to take 360 degrees pictures of the most beautiful places that I visit around the world. If I win the Ricoh Theta, I will use it to take 36 degrees pictures of the most beautiful places that I visit around the world. I'll use it to film naked animals. It looks purple so if it is I will think it's a lollipop and lick it. All jokes aside, I'd take shots of the beach area I just moved to. If I won this prize, my son would use it professionally. He has a red camera and likes to include all sorts of quirky images in the movies and and ads he produces. I would check my pet (Great Dane) while I'm away! If I win the Ricoh Theta, I’ll use it to take great pictures of all my grandkids playing together. I'll bring it to my beach home and shoot awesome 360 panorama pics on the adriatic sea! I'd use it for the Zoo and my pets. I would give it to my daughter, she is an enthusiastic photographer!! Use it to shoot images of the Okc zoo for the world to see. I would use it to take pictures for my blog. If I win the Ricoh Theta, I'll use it to take panoramas in throughout my trips in Florida! I'll use it to take landscape photos. Take pics of my kids. Events and more events! The only true purpose. I would take pictures of my family and when we go on trips. I’ll use it to take pictures . Shoot 365 day video clips for 1 year and keep posting vines..make a project outta it. Gotta use it for the 360 degree photos...awesome! I'll take it on vacations and capture 360 images of everything! I will take it to the forest. I will first use it on my holiday at Christmas. I shall use this device to seize complete control of instagram, tumblr, myspace, facebook, picasa and then the world. I had an Oympus Sp570UZ that had an Auto Stich feature that worked great. So this idea has been around a while. To take picture of everything! If I win this camera, I'll use it to take photos of my nephews playing in their basketball games and for my daughter's graduation next year! I'm a south Florida crime reporter and photojournalist so I'd take 360 panoramas of crime scenes and other places down here. If I win the Ricoh Theta, I'll use it to click pics of every damn thing! take my photo to check it whether i am looking smart or not! If I win Ricoh Theta i will use it a lot while travelling alone to take pics. I'll take it on bike rides! Take 360 pano's of places i'm rock climbing. If I win Ricoh Theta i will use it for my professional work. Take images of architectural projects. I will use it for the best b-day's photos! To take room panoramas for real estate sales. I will take crazy panoramic scenes for my art studio! Possibly dedicate this to museum displays (documenting exhibit spaces). I will create Tiny Planets. I have always wanted to rule my own galaxy! If I win the Ricoh Theta I will use it to simply make panoramas of my favourite places.